Serve this salsa with Southwest-inspired grilled or roasted meats such as Pork Tenderloin with Roasted Garlic &amp; Red Bell Pepper Chili Rub. 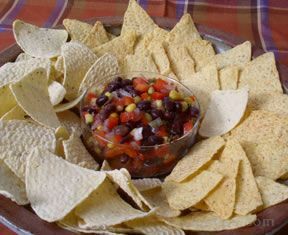 Or, serve as an appetizer with tortilla chips. 1. Mix all ingredients in large bowl until well blended. Cover. 2. Refrigerate at least 30 minutes or until ready to serve. Stir before serving.